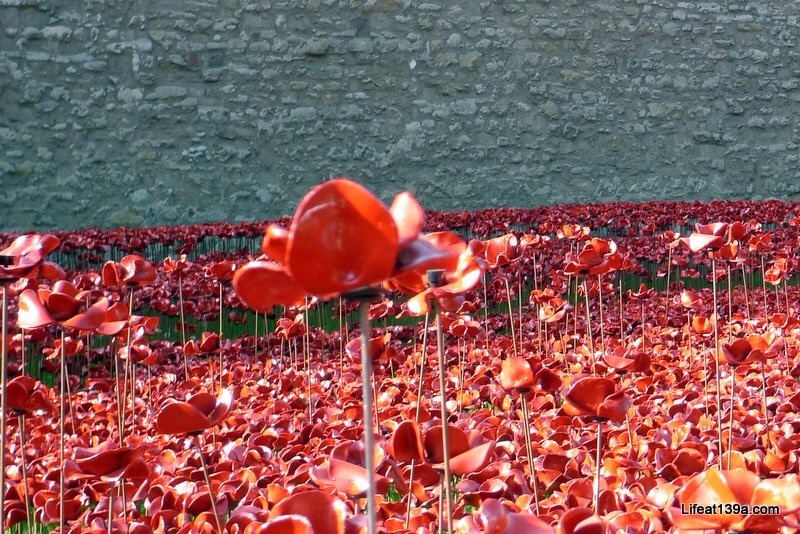 Towards the end of the summer I received an email from Team London with volunteering opportunities and one of those was to plant poppies at the Tower of London. 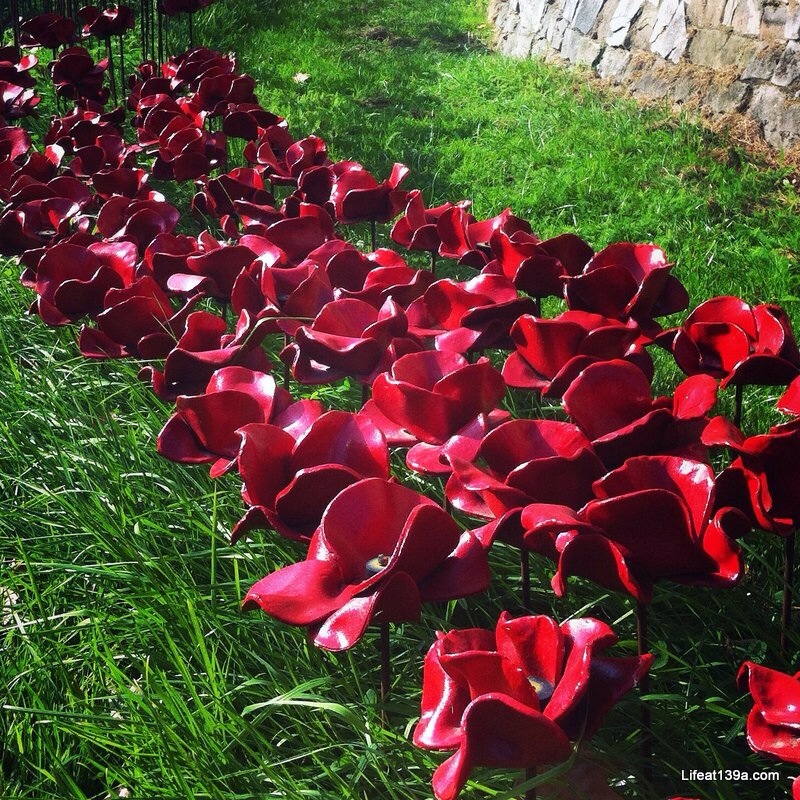 I'd already seen them once - see The Poppies at the Tower of London - and had seen how remarkable the installation already was, so I was keen to volunteer some time to be part of this and to get up close to the poppies too. So at the end of September we headed to the Tower of London for our four-hour volunteerng session starting at 9am on a misty Sunday morning. And that's early for us to be in town on a Sunday morning! After queuing with the other volunteers to enter the moat, we picked up our volunteer t-shirt and commemorative badge and having been split into groups of around twenty to thirty we watched a short film explaining the story of the poppies and how to to assemble them. Then we picked up our protective gloves and headed out into the moat - somehow, I don't know how I managed to pick up a pair of left-handed gloves! Luckily I'd brought my gardening gloves so quickly swapped to using those. I'd also brought some foam pads to kneel on and our knees were soon very grateful for those too! 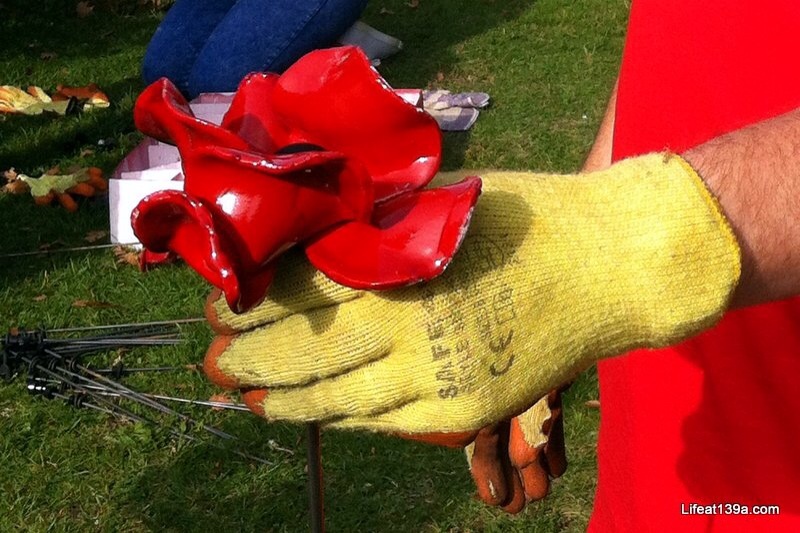 Each group of volunteers split into two teams with half assembling the rods - small washer, large washer, spacer, end-cap which became our mantra - and the other half planting the poppies. We were assured the groups would swap over so everyone would be able to plant poppies (and we did) so we started assembling the rods. It wasn't quite as easy as it sounds. Some of the washers were quite hard to get onto the steel rods, which came in three lengths. Soon the gloves were abandoned as we knelt around the makeshift pallet tables and tubs of washers, spacers and end-caps. There was a knack to assembling the rods and it did (mostly) get easier, although there were some that I passed over to MOH for expert attention! The atmosphere among the volunteers was friendly and amicable although we were aware of the significance of each poppy, and each poppy was planted with the respect it deserved. We swapped to planting poppies, and clearly we needed the poppies which were stored in boxes at the edge of the moat to do that. To add the poppy to the assembled rod we needed to remove the end-cap and the spacer, add the poppy and then replace the spacer and end-cap. Then wearing the safety glasses - by now over our sunglasses as the sun had seen off the mist and it was a lovely day - we planted the poppies. There's a method for the three differing heights too, every half a metre there's a mid-height poppy and every metre there's a tall poppy. 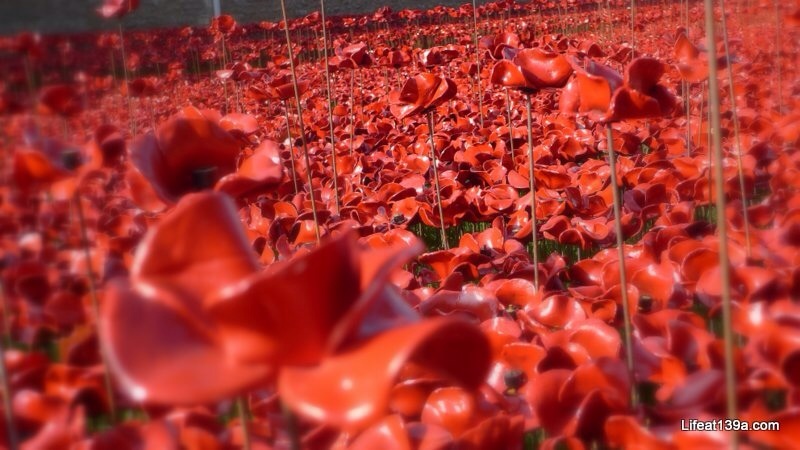 The majority of poppies are on steel rods approximately 50cm tall and we were encouraged to plant these so the poppies were touching. They looked better planted closely together, but I imagine there was also the need to fit in all of the 888,246. 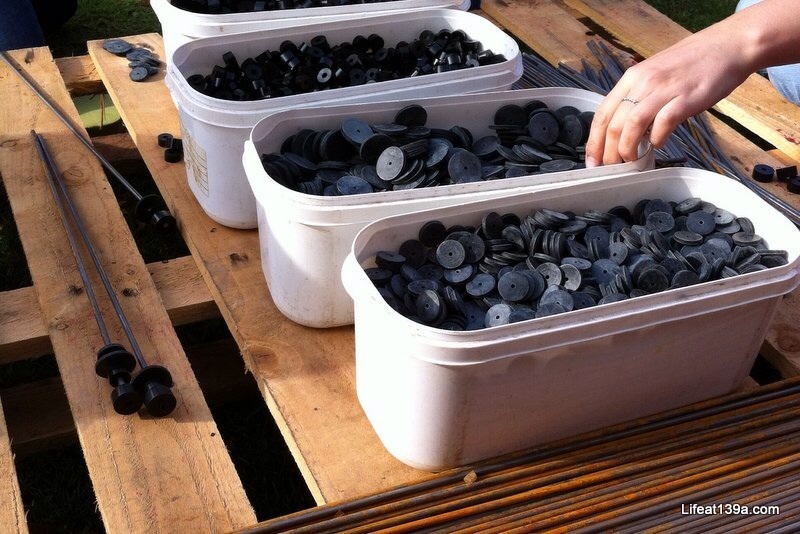 We swapped back to assembling rods and if you saw my Black and White photo this Sunday - see Black & White photo 18: #TowerPoppies - you'll have seen that it was tough on our thumbs. We each had blisters and the cuticles on my index finger were split however this seemed a small inconvenience given the sacrifice that each of the poppies represented. 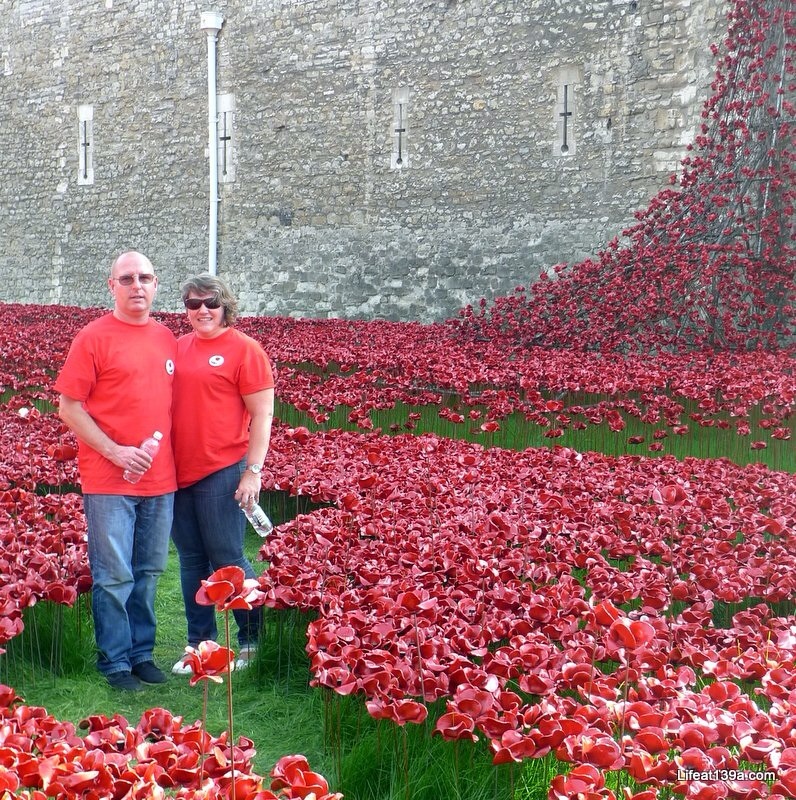 In each four-hour volunteer session they anticipate planting between five and seven thousand poppies. Just before midday, so about three hours into our shift the team-leaders said we could start packing up as in that session the volunteers had already assembled and planted seven thousand poppies! There were a lot of volunteers there that morning - perhaps a hundred or so, but that's a still a lot of poppies planted.